An image from Mitchell's book about Havana, El Paquete. Tyler Mitchell photographed Beyoncé for the September issue of Vogue. 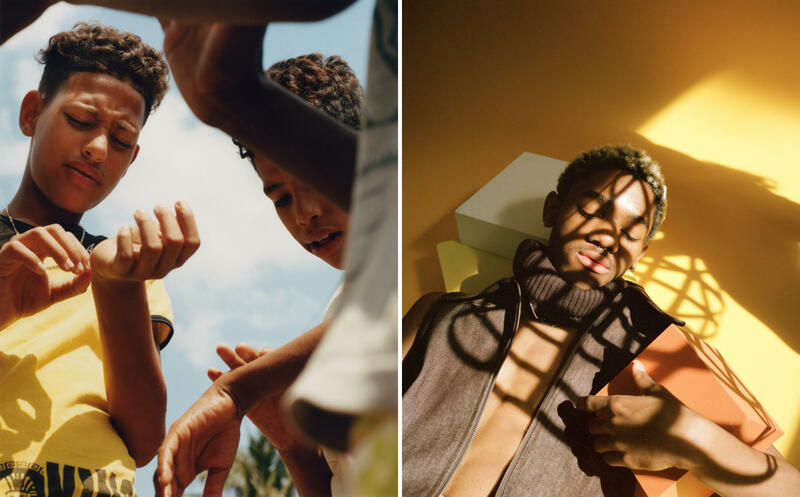 Photographer Tyler Mitchell was the first African-American to photograph a cover for Vogue. 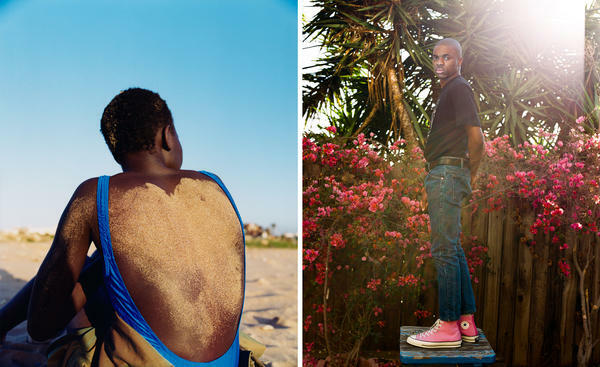 (Left) An image from a fashion spread in More or Less magazine; (right) Vince Staples was photographed for Dazed. 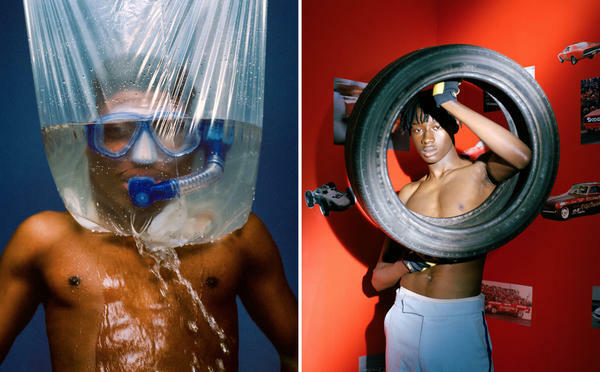 Two photographs from Mitchell's "Swimming" series. Two photographs from Mitchell's personal projects. "Photographers live their whole life to shoot this cover slot in this month," Mitchell told All Things Considered host Audie Cornish. "But I think I kind of approached it with a kind of practicality of trying to shoot [Beyoncé], like how I would shoot my friends. So it was beautiful and nerve-wracking and exciting all at once." Before being chosen for the fashion issue cover, Mitchell had worked with TeenVogue on a cover and other pieces for the magazine. But to land the Vogue cover on this particular month, he says, was a huge deal. "It was at once totally unreal and also felt like I had been living my whole life to receive that call," Mitchell said. "So I think there's a level of amazing kind of magic to it." 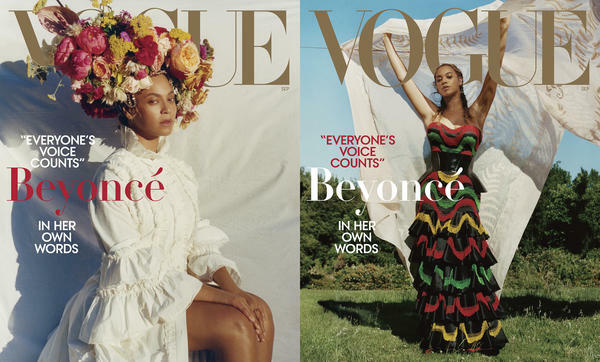 The September issue of Vogue, known as the magazine's big fashion issue, is one that hasn't historically featured many people of color. This is Beyoncé's second time as the face of the September issue, and in an interview with the magazine, she speaks about wanting to help elevate other African-American artists. Mitchell says he sees the opportunity as something the entire community of African-American photographers has been working toward. "You know, we should be shooting covers of Vogue month to month, not just as a first," he says. But for much of history, Mitchell says, racial and economic factors kept black photographers like him from reaching the heights of the profession. "[Photography] was known as a rich man's art, so it was mostly for white men who were able to afford all of the chemicals, the films, the cameras that went into it in the very early stages," Mitchell says. "It's a historical thing that goes into why there just haven't comparatively been as many black fashion photographers as white fashion photographers. But the part that I can't answer is why they haven't been recognized ... the amazing black photographers and black fashion photographers that have been shooting." Mitchell says that as technology improves, photography is becoming more democratized. With higher-quality cameras embedded into smartphones and public platforms like Instagram that are accessible to almost everyone, the landscape has changed. "The iPhone is the thing that opened up everything," Mitchell says. "The beautiful thing about now is that it's no longer somebody that can afford the best camera, but it's about what your eye says." Operating as a one-man show, Mitchell uses Instagram to promote his own work. Even before his shoot with Beyoncé, he landed spots with brands and major publications on his own. But before all of that, Mitchell says, he focused on video, shooting and creating skate montages of his friends in Atlanta. It was only after a trip to Cuba when he was 20 that he says his focus shifted mainly to photography. 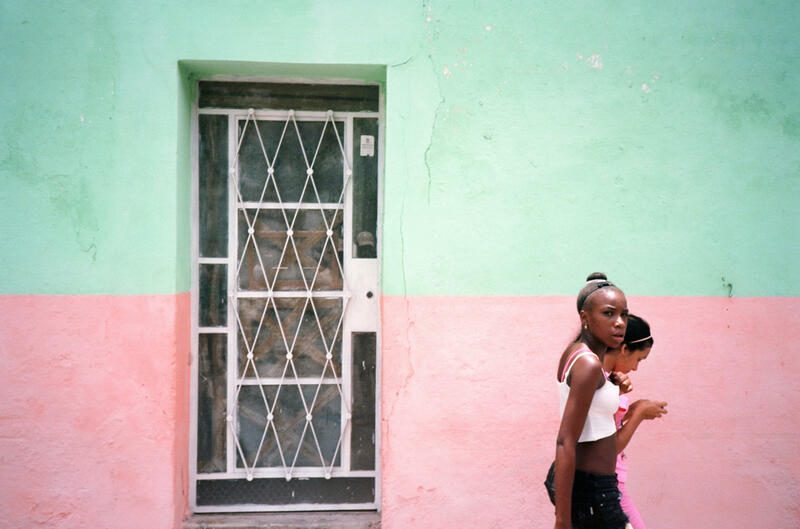 In Havana, he documented the architecture and the city's emerging skate scene to put together a photo book, El Paquete. 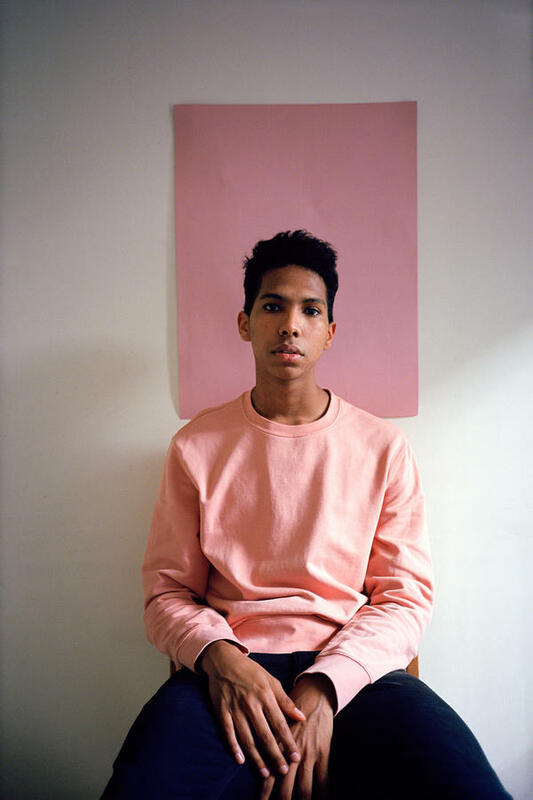 Now, he tries to re-create the color palette he found in Havana in his work, using it to express how he feels and showing that black and brown bodies deserve to live in idyllic spaces. "There's a lot of in my work the black body searching for an idyllic space. And I think the use of vibrant color, the use of natural light, the way that that kind of colors and taints black and brown skin to me feels a lot of how I feel," Mitchell says. For Beyoncé's shoot in particular, Mitchell says he researched the background imagery surrounding African-Americans and the African diaspora. Specifically, he says he looked to Congolese and Haitian references. "Beyoncé really wanted to elevate everything to a new level," Mitchell says. "She was really collaborative and adamant on kind of very glamorous fashion mixing with cultural references that kind of feel like the tropics, so I think her and Vogue really liked my use of natural light ... vibrant color, and we really stuck to that." Even in the images from the Vogue shoot, Mitchell says there are elements of his time in Cuba. In one of the cover photos, Beyoncé is seated, wearing a white dress in front of a white sheet hanging on a laundry line, with a huge crown of flowers piled high and adorning her head. "The laundry line references made me think a lot of Havana, a lot of the history of working black women and the color palette associated as such," Mitchell says. In another photograph, Beyoncé stands in front of a custom tapestry painting, wearing a custom-made Grace Wales Bonner suit. "If you look closer at the detail, the neckline is actually the colors of the African flag, which is actually so beautiful, and then it's embroidered with Swarovski crystals," Mitchell says. "We decided to pair that up with this custom tapestry painting." The tapestry is reminiscent of pop-up style photo studios in African-American history that would use whatever backdrops they could find, Mitchell says. "I think about those which in a way people would consider ghetto, but I find very creative and I find very beautiful," he says. "So I think it's in conversation with that and I think you can feel that, but it has a more romantic kind of touch with the natural light and the outdoors." Mitchell says the Vogue cover and the opportunity to work with Beyoncé have already been a huge door opener and are just the beginning of more art to come. 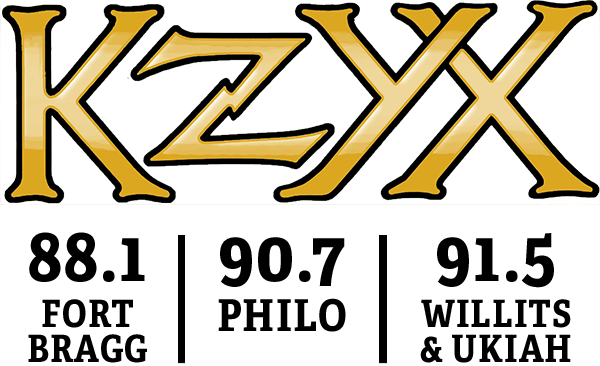 The audio story was produced and edited by Kat Lonsdorf and Renita Jablonski.